The Cathedral Ladies’ Guild welcomes ALL women and girls age 16 years and older to join. The mission of the Guild is to promote unity of all women of the Holy Mother of the Rosary Cathedral and to promote activities for the good of the parish and all parish members. These “prayer warriors” also prayer for special intentions for parishioners, their friends and families who request special intentions. The Guild also holds fund raising projects to satisfy the various needs of the parish, i.e., floor buffer, altar linens, Bibles for confirmation class graduates, youth camp and convocation to name a few. Charity drives are held to benefit the community and organizations in need, such as the Ronald McDonald House, Lancaster Food Pantry, Kids Escaping Drugs, and charities of interest to our members. At least once a year the Guild runs a function exclusively for the camaraderie and fellowship of its members. Past activities include tea at Asa Ransom House, an evening of dinner theater, and boat cruises through the Buffalo waterfront. Come join us!! 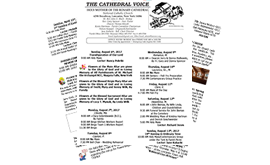 A notice of meetings is posted in the weekly bulletin and online.